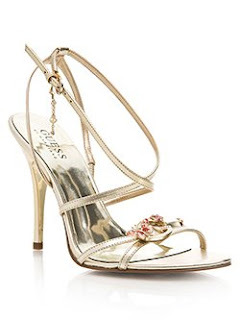 A glamorous and girly going out shoe. Strappy sandal with G-logo charm. Additional butterfly and flower details. Rhinestone accents. A twist on the strappy sandal. Bold leather cross-strap detail. Double harness buckle at ankle.